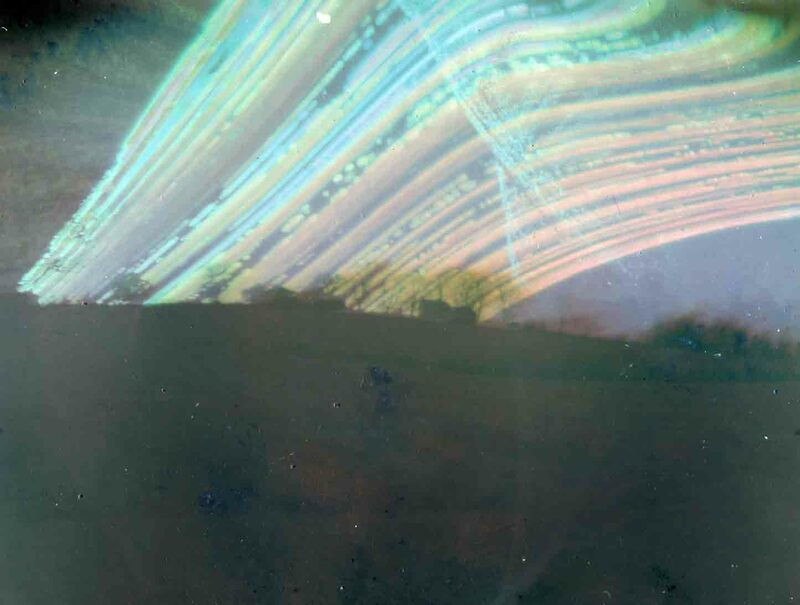 Solargraphs are long exposures using a pinhole camera. The exposures can be as short as one day or as long as six months. Solargraphy got its start from the original idea of artists Pawel Kula, Slawomir Decyk and Diego Lopez Calvin during 2000-2002. 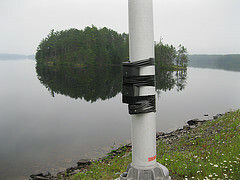 In this project some Polish and Spanish photographers launched a call to artists through the internet in order to fix pinhole cameras over different latitudes to compare how the Sun tracks were different for each participant’s location. They synchronized the start and ending times of the exposures with the solstices and shared the results in a website called SOLARIS PROJECT. I was first introduced to Solargraphs by the photographer Dennis Stein when we were discussing all the different approaches artists were taking with pinhole photography. I made my first solargraph out in the bog behind my home. The resulting image ended up receiving an Honorable Mention prize for the 2013 Annual Juried Show at the Harlow Gallery in Hallowell, Maine by jurors Bob Keyes and Dan Kany. 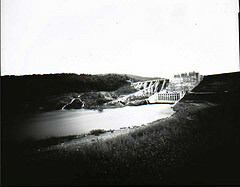 Later that year I produced the six month exposure of Fayette (seen above) with a 9th grade student as part of her Science Fair project on pinhole photography. Denise Froehlich of the Maine Museum of Photographic Arts stopped by the studio one day and saw the Solargraphs. She fell in love with the imagery and asked if I was interested in showing at the Museum. 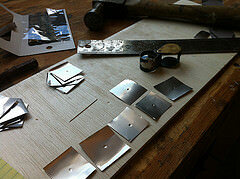 I did not hesitate to say ”yes!” The project parameters jumped into my mind soon after. 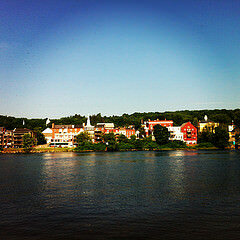 The Kennebec River has been a source of learning for the nearly 30 years I have returned to live in Maine. I saw my first bald eagle on the Kennebec River in Gardiner. I revel in watching the sturgeon jump in the river each spring. I watch and wait to see if the spring thaw brings ice jams that will pile up and flood Hallowell and Gardiner. In the dead of a frigid snow-less winter I have skated out onto Merrymeeting Bay and grasped how small I was when I stood there in the middle of the mighty river fearfully listening as the ice groaned and cracked as the river moved beneath me. I hike the wilderness around the tributaries leading to the Kennebec observing the swamps and fragile ecosystems of the wetlands which feed it. 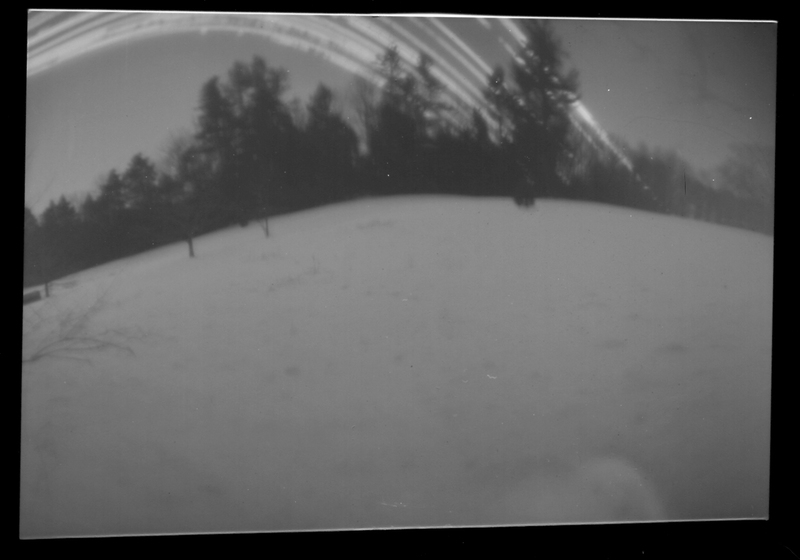 This Solargraph project serves to capture the light of the Kennebec from June to December of 2014. It is my Ode to the fragility of time and place. Parts of this body of work I produced are on exhibit along the Kennebec River. After seeing my work projected onto the big screen during my PechaKucha presentation in Portland in February, I hope to project it at other locations along the river the summer of 2015. 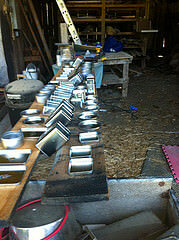 I made 120 pinhole cameras out of various sized tin cans. I made pinholes for each group of cameras according to the focal length of the tin can and loaded each camera with photographic paper. I began the project at the Summer Solstice. I owe a debt of gratitude to Kimberly Christopher at Three Rivers Whitewater in the Forks, Maine. She put me in contact with Brookfield Energy to get permission to install the cameras at Harris Station Dam on Indian Pond, the main source for the Kennebec River which comes out of Moosehead Lake, and she let us stay in one of the cabins at the Campground! There are great swathes of cornfields and hay fields on both sides of the river once you get below Bingham. 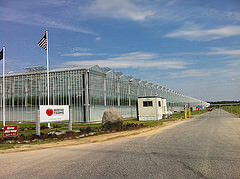 It was good to see Backyard Farms back in production in Madison. Here is a Press Herald story on what went wrong when they had to close up from the whitefly infestation! 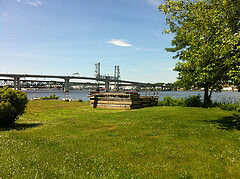 Agriculture is a major industry along the Kennebec River. 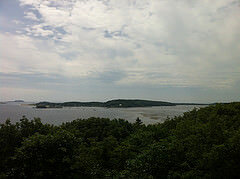 Conventional and organic farmers from Caratunk to Phippsburg share the rich floodplains. Agricultural runoff is a major contributor to the water quality of the river. Pesticides from conventional farms seem to have overtaken the paper mills as a leading contributor to pollution. The annual memorial ceremony takes place at the site where the historical Abenaki village of Norridgewock once stood. Prior to an attack by the British army on August 23, 1724, this central community had existed in basically the same location for thousands of years. Many North American Indians from across the region can trace their heritage back to communities like Norridgewock, historical places where their ancestors had lived in relative peace and prosperity before the colonists changed the landscape of the region. The Norridgewock memorial represents more than the attack, massacre and forced relocation of one group of Abenaki or Wabanaki people. Norridgewock represents the combined experiences of all of our ancestors, who survived or who perished in the struggle to maintain their lands, their culture and their way of living. Norridgewock is also representative of the vast network of relations that Abenaki and Wabanaki people are interwoven with and connected to. Today, for instance, families from the Abenaki, Penobscot and Passamaquoddy tribal nations trace their ancestral roots back to Norridgewock. Remembering Norridgewock is also important today, because it offers all of us an opportunity to come together, as allies, friends and extended family, to strengthen our network of relations and to build a future for all of our children and people. 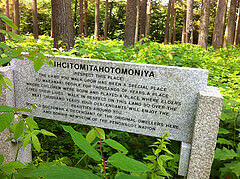 We acknowledge that there are many, many places like Norridgewock where Native people were displaced, and perished. We also acknowledge that many of the stories haven’t been told, and that in some cases, the ancestors haven’t been properly remembered or grieved for. Norridgewock is a beginning for this process. I would like to thank the Vaughan Homestead, the Harlow Gallery, and the Kennebec Land Trust for kindness and permissions in accessing property and letting me place cameras on their land! I’d like to thank the Chop Point School and the Phippsburg Land Trust for letting us install cameras on their land! The project started at the Summer Solstice. It took from mid-June to mid-August to set them all out. 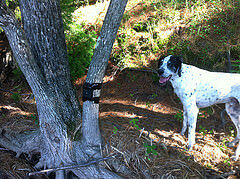 And then it took from mid-october to mid-November to retrieve them. Out of 120 cameras I lost 38 to vandalism or the weather. 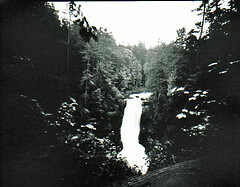 Out of the 82 cameras, I ended up with about 45 successful images. I posted some of the solargraphs in the Photography section of my website.